Summer is well underway and we've been busy...but in a slow-motion, taking-it-easy kind of way. This mini album kit has been sitting in my Studio the past few weeks just waiting for me to photograph and package it up. And I finally did last night. 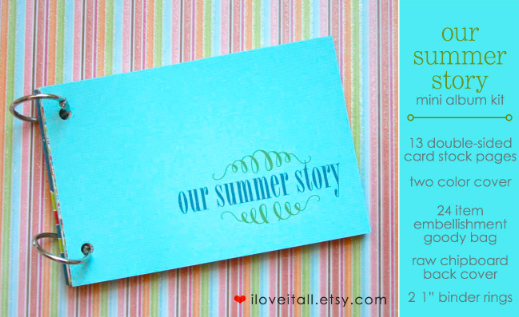 Even though I've just added them to the shop, I've been using mine to document our own summer story and I'll be sharing pages from our summer story mini album here on Wednesday. Until then, you can find the kit in the shop here. So, what's been your favorite summer memory thus far? What a great mini album kit, as always, Monika! I can't wait to see what you've done with yours! Thanks...it's always fun to play around with pretty paper and photos! Love this mini album kit! Great job!